Its all about comfort, when it comes to fashion. Thats the first thing we think of before dressing up, not only for occasions but everyday. We love easy, effortless and wearable styles . Minimal and basic , How do you wear basics with a pop style and Bohemian style is what our today’s blog is all about ! 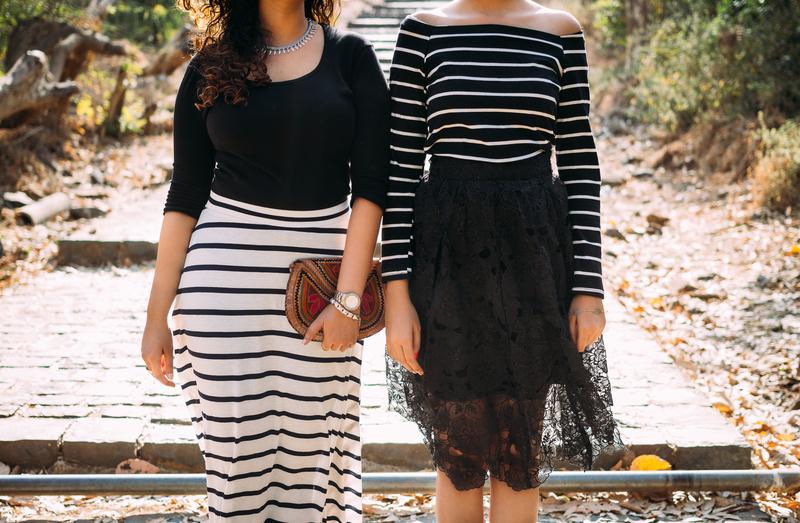 You’ll spot us wearing basics and boho style time and again be it for blog shoots or our OOTDs. So Shruti owns her style with this White Maxi dress which is actually a long kurti which is picked up from her mom’s closet and to get a proper body shape she has worn it with tan belt pairing it with denim jacket to add some rugged look, as its all about playing with basics. The pompom tan flats which is a DIY done by her,those were basic tan flats have attached those pompom with Fabric Glue, that brown fringe bag and you are sorted for Day out. Coming to Sanskruti’s look, isn’t she looking like a Punjabi Kudi here !? Well we feel that ! A basic Color splash silk kurti worn up with some DIY accessories, pairing it with black comfy palazzo’s and pompom flats with a cute handcrafted bagy and yeah you get that look ! About the neck piece DIY its a Broche attached with two anklets at both the ends to get a neckpiece which completely adds Boho look to the outfit, the cotton handwork bagy with pompoms. When you finish reading, do leave a comment and let us know what items you have to create this look and your favorite ways to style these pieces! Previous articleSun and Fun-with Brime !